Direct measurement of oxygen volume during maximal exercise, or VO2max, is regarded as the most precise method for determining cardiorespiratory fitness, which is the ability of the circulatory and respiratory systems to supply oxygen during sustained physical activity. 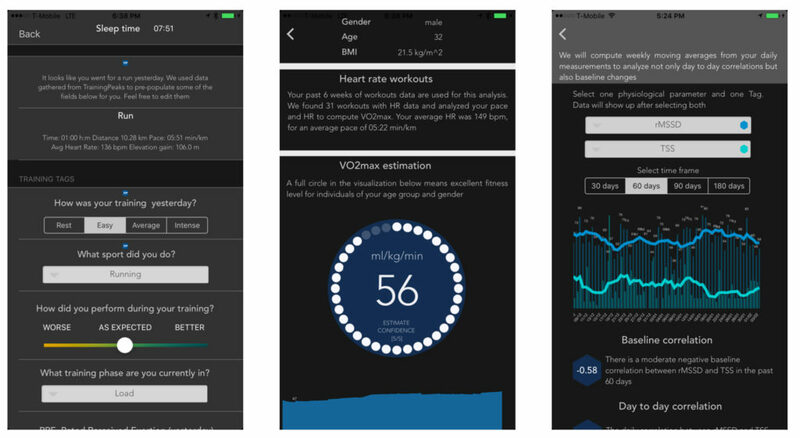 As more products on the market start to provide VO2max estimates, it’s important to try to understand how these models work, what are the advantages of models using certain predictors (resting heart rate, HRV, workouts data, etc. ), what are the general limitations and what we can use these estimates for. 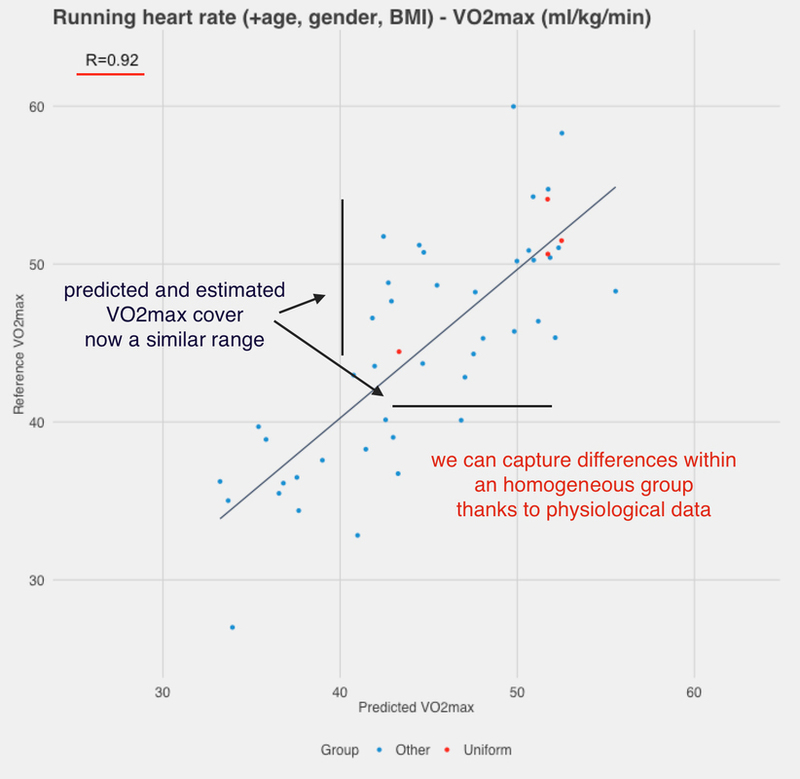 In this post I’ll go over the main differences in models using no physiological data, resting physiological data and workouts data to estimate VO2max. We will show how VO2max estimates from workout data provide several advantages. 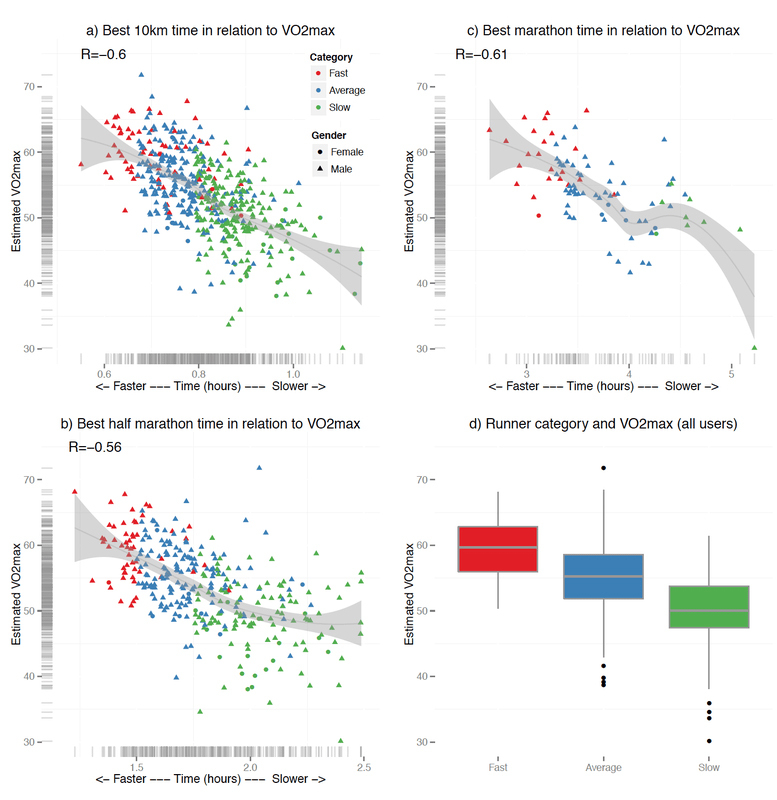 In a recent publication using HRV4Training data, we showed a moderate-to-high correlation between our VO2max estimate and real life running performance over distances between the 10K and full marathon, highlighting how these VO2max estimates could be used as a proxy to performance. Using the latest TrainingPeaks APIs, you can link HRV4Training to TrainingPeaks and get VO2max estimates directly from workouts data, as explained here. Anthropometrics data only (or non-exercise models), including Body Mass Index (BMI), age & gender (some websites or “online calculators” use this approach). Resting physiological data, including anthropometrics and resting Heart Rate (HR) and Heart Rate Variability (HRV). Sub-Maximal HR data (workouts data), such as HR while running at a certain pace, as used in HRV4Training, Firstbeat and Garmin. 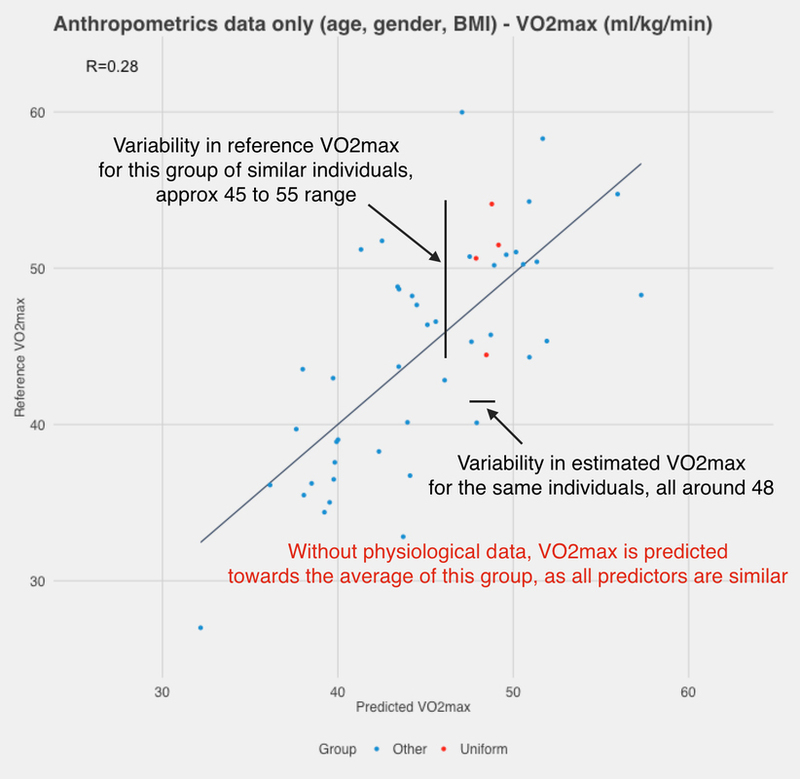 Models estimating VO2max using anthropometrics data only have been proposed for many years in research (see Jackson et al., published in 1990, or Baynard et al., just published). The goal is to get to a decent estimate without having to perform any measurement or test. 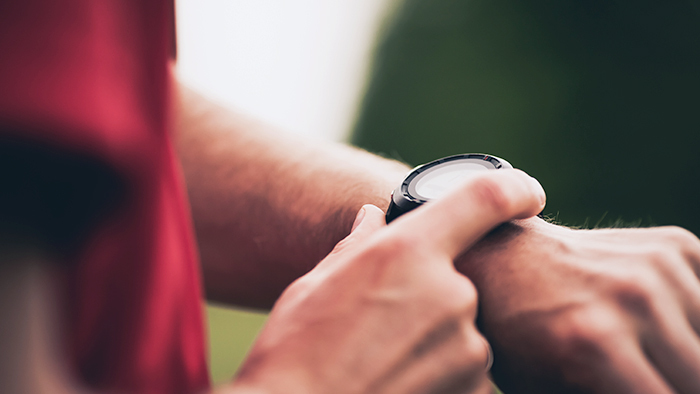 Some of the most recent models actually do include resting heart rate measurements, as anyone can easily collect their resting heart rate, and some other models also include a person’s activity level, quantified in different ways (e.g. a number indicating how active you are). Our dataset is about 50 individuals that I collected during my PhD studies. Regardless of differences in the populations investigated, results are very similar to published literature. For example, Baynard reports R2 = 0.22 when including only BMI as predictor, and R2 = 0.57 when adding BMI, age and gender. On our dataset, when replicating the author’s work, we get R2 = 0.18 for BMI only and R2 = 0.54 when including BMI, age and gender. Considering that R2 (and any other metric) is highly dependent on the dataset (for example on how much variability we have in the data, for both predictors and predicted variables), these numbers are extremely close. A good starting point for our modeling. VO2max is known to decrease with age, is lower in women, and is also lower in individuals with higher body fat. As the aim of these models is to be as simple as possible, BMI is typically used as a way to capture body type, even though there are obvious limitations, as BMI does not capture anything related to actual muscle mass compared to body fat. Now the more interesting question is, how much better can we estimate VO2max when including heart rate? If we go back to our previous dataset and include resting heart rate together with BMI, age and gender, we obtain R2 = 0.59, a small but significant improvement compared to the previous R2 = 0.54. Models including non-exercise parameters combined to physiological data have also been validated in the past, and sometimes showed poor results, see for example Esco et al., however, they do perform better than the previous models including only anthropometrics data. What about HRV? Adding HRV seems to bring no improvement (same R2 and standard error that we had before including resting HR). As a matter of fact, adding HRV and removing resting heart rate also brings no improvements with respect to the original model using only anthropometrics data. This is something I’ve been arguing for some time, as HRV reflects very well training load and the impact of different stressors, but not necessarily fitness or aerobic capacity. It is true that some studies showed improvements in baseline HRV for individuals starting an aerobic training plan, however these findings often failed to be replicated (also, typically everything changes when taking inactive people and getting them active, however if we take a group of already active people things get more challenging). Additionally, there is so much variability in day-to-day HRV scores (easily 50 percent of your baseline or more), that in general I am personally a bit skeptical of any HRV data reported as a single snapshot before or after a study. In my opinion a baseline of at least a week should be collected pre- and post-study in order to get more confident on an individual’s HRV level without being too sensitive to acute variations, otherwise we might just be trying to interpret noise. The rationale behind including sub-maximal HR data is the same as for resting HR data. As we train aerobically and get more fit, sub-maximal HR reduces, meaning that we can for example run at the same speed but with lower heart rate. The reason why we prefer to use sub-maximal HR with respect to resting HR is that these individual differences due to fitness get exacerbated during exercise. Two individuals of quite different fitness levels might have a very similar resting HR, say 50 and 55 bpm. However, during the same intense exercise, say running at 12 km/h, the HR of the unfit individual will be much higher (all other things being equal, so similar body size and age, etc.). This is the principle we exploit with our VO2max estimation in HRV4Training, as we capture workouts data from TrainingPeaks, and can analyze HR at different speeds for a broad set of individuals. Intuitively, the ones that can run faster and keep their HR lower, are most likely the fittest. Let’s include sub-maximal HR in our models. What we get for running HR, even at a speed as low as 8 km/h is R2 = 0.67 and a standard error of 4.1 ml/kg/min. Much better than before. Here I’d like to highlight how including sub-maximal HR is extremely important, and is actually the only way to discriminate between individuals that are similar, which is probably your case if you are into training (hence in the more homogeneous and fit part of the population). It’s always easy to show high correlation or R2 on a dataset with much variability. Say we take thousand of individuals covering a very broad range of BMI and VO2max, from sedentary, obese, unfit individuals to IRONMAN participants, obviously BMI will be a great predictor of the differences in fitness between these individuals. But what if we look at similar individuals? People can have similar body size (and age), and yet be extremely different from a cardiorespiratory fitness point of view. Without physiological data, we cannot tell the difference. To highlight this point, I’ll isolate a subset of participants with similar characteristics, for example, I took individuals aged 21-25 years old and with BMI between 22 and 24 kg/m2, male only. This is a rather homogenous sample in terms of our predictors. What happens when we try to predict their VO2max using anthropometrics data only? We talked a lot about modeling and advantages of using physiological data, especially workouts data, to estimate VO2max. However, the most important point here is the practical implication of these models. They work better for our lab predictions, but are they really useful? What can they tell us? As our dataset grows, and more people are linking HRV4Training to their actual training data, we started answering these questions by analyzing the relation between real life running performance and our estimated VO2max. A strong relation would mean that our estimate is indicative of running performance. Estimated VO2max can potentially be used to track individual performance outside laboratory settings, driving motivation and helping athletes of all levels keep track of progress as well as adopt individualized training plans based on a person’s physiological response to training. While we looked at the relation between running performance and VO2max at the population level, it will be interesting as more data is gathered, to investigate individual variance and if performance and VO2max estimates change accordingly over time within an individual.